An aerial survey last year found that elephants might be locally extinct in northern Central African Republic. The survey also showed that the poaching crisis had taken a considerable toll on many other large mammals, including giraffe, African buffalo and the giant eland. A park in eastern CAR shows that threats to wildlife can be tackled, but security is required first and foremost. 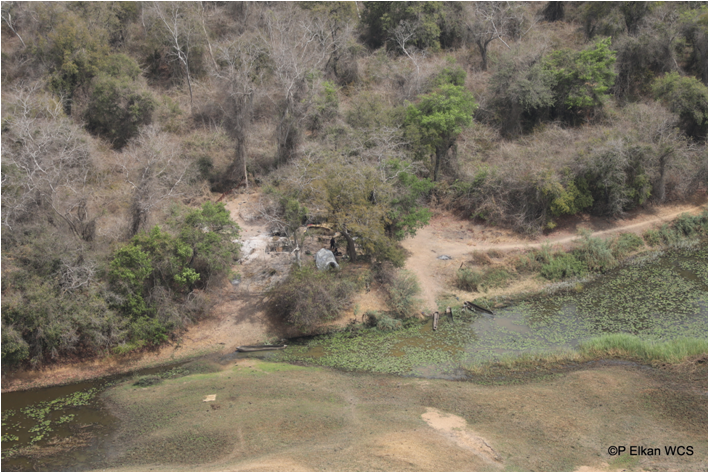 Years of civil war and poaching have virtually wiped out elephants from one of their historical strongholds in Central Africa, an aerial survey conducted last year by the Wildlife Conservation Society (WCS) indicates. The survey, in northern Central African Republic, found surviving but small populations of giraffe (Giraffa camelopardalis), giant eland (Taurotragus derbianus), buffalo (Syncerus caffer) and roan antelope (Hippotragus equinus) — but not a single bush elephant (Loxodonta africana). The destruction of the CAR’s once abundant wildlife is due to poaching and illegal trafficking rooted both inside the country and in neighboring nations. This is part of a historical phenomenon that has been exacerbated by the country’s civil war, ongoing since 2013. But experts in wildlife protection say there is still hope for the nation’s wildlife. If the CAR can preserve its rich habitats by scaling up and strengthening conservation efforts that are currently undermined by conflict, it could not only potentially bring back wildlife, but also greater security for its citizens. Two teams from the WCS, ECOFAUNE+ (a European Union-supported conservation project) and staff from the CAR’s Ministry of Environment performed the survey in March and April 2017. Their planes covered 63,657 square kilometers (24,578 square miles) across several national parks and their outskirts: Bamingui-Bangoran, Manovo-Gounda St. Floris, Vassako-Bolo Nature Reserve, Gribingui-Bamingui Faunal Reserve, Aouk Aoukale Wildlife Reserve, Yata Ngaya Faunal Reserve and Presidential Park Awakaba. Conservationists had earlier conducted similar surveys across 21 African countries, but the armed conflict in the CAR delayed them here. 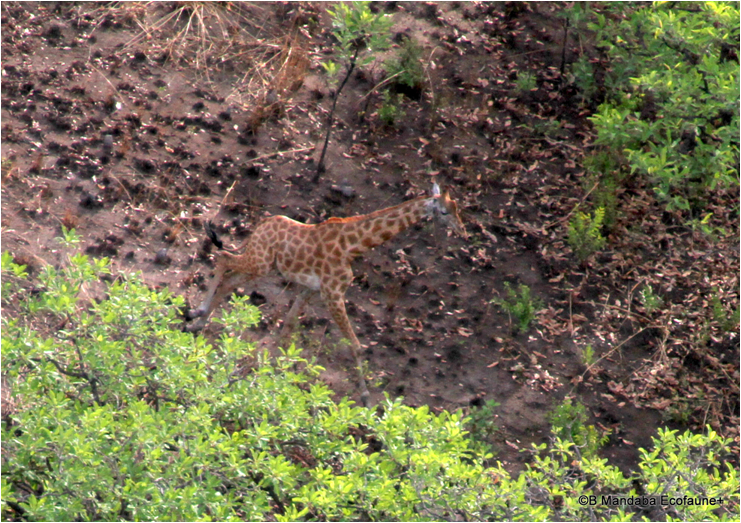 The survey identified a small number of highly endangered Kordofan giraffes in northern CAR. Photo: Paul Elkan/WCS. They discovered, once the survey was carried out, that elephants were missing from large areas of their historical range. In 2005, conservationists found 929 elephants in the region, but five years later there were just 68. Those last elephants may now be gone. This absence points toward a gradual decimation of their populations that started at the end of the 1970s and gained momentum again after 2000. The teams found small numbers of highly endangered Kordofan giraffes (Giraffa camelopardalis antiquorum), giant elands and buffalos. Warthogs appeared to have declined in some areas in the survey, while roan antelope and bushbuck (Tragelaphus scriptus) populations remained stable, with frequent sightings of Grimm’s duikers (Sylvicapra grimmia) and red-flanked duikers (Cephalophus rufilatus). Wildlife poaching is not new to the CAR. The ivory poaching crisis of the 1970s and 1980s saw Sudanese poachers on horseback ravaging elephant populations. Automatic weapons replaced traditional spears, and elephant numbers dropped from around 35,000 in the 1970s to 4,000 by the mid-1980s across the country. “We focused on the area because historically, in northern CAR, Bamingui-Bangoran [National Park] was a real stronghold for elephants,” Elkan said. Surveys done in 1985 and 2005 showed a plummeting trend that Elkan said could be attributed to ivory poachers from Sudan and Chad. But in the last seven years, local poachers and armed groups have become heavily involved in the bushmeat trade. “This is what led from an elephant poaching focus to a broader, all-wildlife one,” Elkan said. But the story is not confined to the north of the CAR. David Simpson, manager of the Chinko National Park, describes a similar history for the southeastern part of the country. Today, Chinko is run by African Parks, a South Africa-based organization focused on national park rehabilitation and long-term management in partnership with governments and local communities. They hope to revitalize the park through strong security. According to Simpson, now that the elephants are largely gone, poachers are targeting other animals. 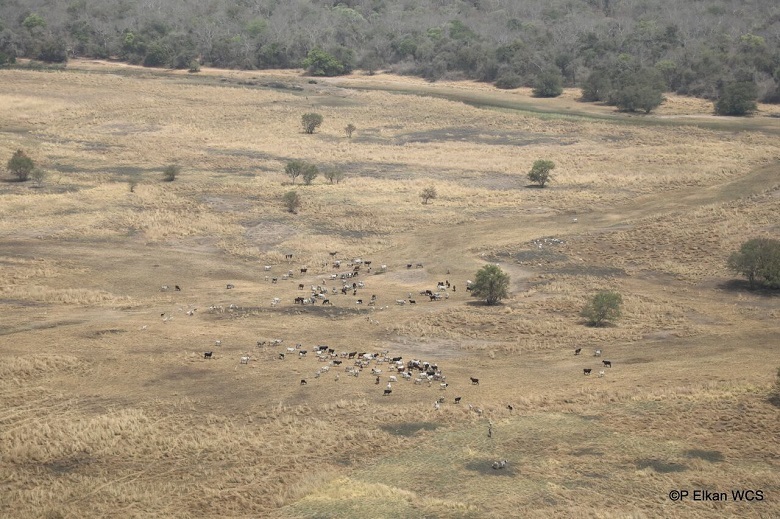 Moreover, cattle herders from Chad and Sudan have overrun parts of the park. The cattle started showing up in 2012, and today the park estimates cattle numbers at 200,000 head or more in eastern CAR. The herders, usually working for wealthy individuals, are doing much of the poaching, he says. “They dry the meat, then sell it in villages or back in Sudan. It’s like a bonus that the boss doesn’t know about. And it often can fuel the conflict, as meat goes directly to feed the rebel groups,” Simpson said. Reports from local anonymous sources suggest that armed groups are allowing access to commercial hunting as compensation for military service. The meat also goes to Bangui, the CAR’s capital, which over recent years has become a hub for the illegal trade, according to Elkan. Though numbers are difficult to pin down, the U.S. Fish and Wildlife Service has labeled the bushmeat trade across Central Africa “the single greatest threat to wildlife” there. The agency estimates that the region as a whole consumes about a million metric tons of bushmeat annually. The civil war that erupted in 2013 not surprisingly severely undermined conservation efforts. Rangers were forced out of Manovo-Gounda St. Floris National Park, Elkan says, though some remain in Bamingui-Bangoran. “It’s an area that needs to be saved, to be invested in from a security perspective, as well as from a conservation justification,” he said. As poaching threatens to spill over into northern Cameroon and Chad, securing the region would provide a buffer for these countries as well, he added. But the CAR government currently controls just 10 percent of the country, with the rest divided between 23 different armed groups. Such instability leaves little space for regulating cattle or providing any security for people and wildlife. What’s happening in Chinko may prove an example of how to turn the tide. In the last three years that African Parks has had full control over the park’s management, it has succeeded in controlling both poaching and herders, according to Simpson. At the same time, 300 people displaced by the war have found refuge in the park. The WCS is now hoping to turn things around for the surveyed parks in the north. It is discussing long-term park management with the government for these once-wild landscapes. “This will lead to stabilizing the country, securing wildlife and protecting people,” Elkan said. #anti-BalakaAouk Aoukale Wildlife ReserveBamingui-BangoranbuffaloCAR elephantsCAR poachingCentral African RepublicgiraffeGribingui-Bamingui Faunal ReserveKordofan giraffeManovo-Gounda St. FlorisPaul Elkanroan antelopeSelekaVassako-Bolo Nature ReserveWCS CARYata Ngaya Faunal Reserve and Presidential Park Awakaba.